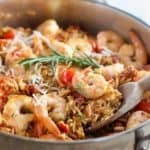 30 Minute Shrimp and Orzo with Sun Dried Tomatoes! – And did I mention its all cooked up in one pan? We are crazy for Orzo around here! It’s cooks up super quick and is a nice change from plain old rice. After you toast it up it kind looks like Rice-a-Roni, the San Francicso treat! (age is showing :). 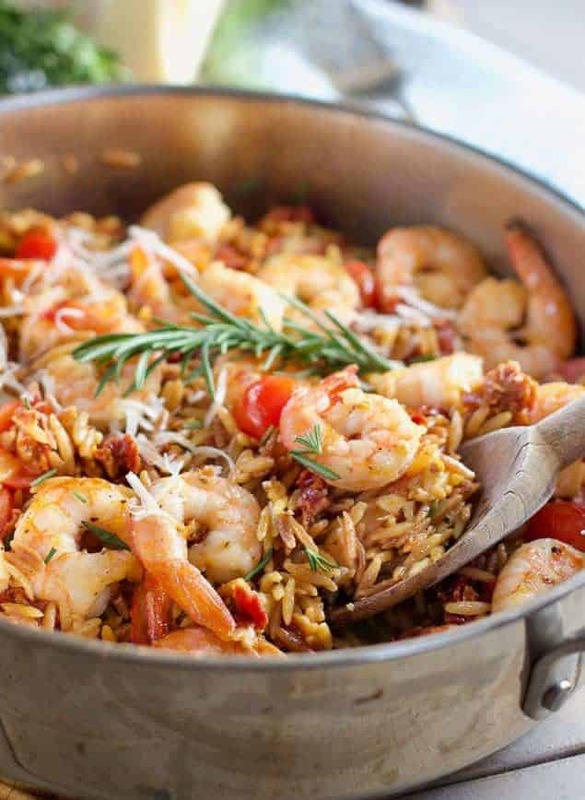 I wanted to amp up the Shrimp and Orzo Pasta dish we posted last year. And right now, sun dried tomatoes are my thing. Crazy good! They add so much flavor and are so easy to use. I use the oil the tomatoes are packed in to saute’ up my shrimp, adding even more flavor! 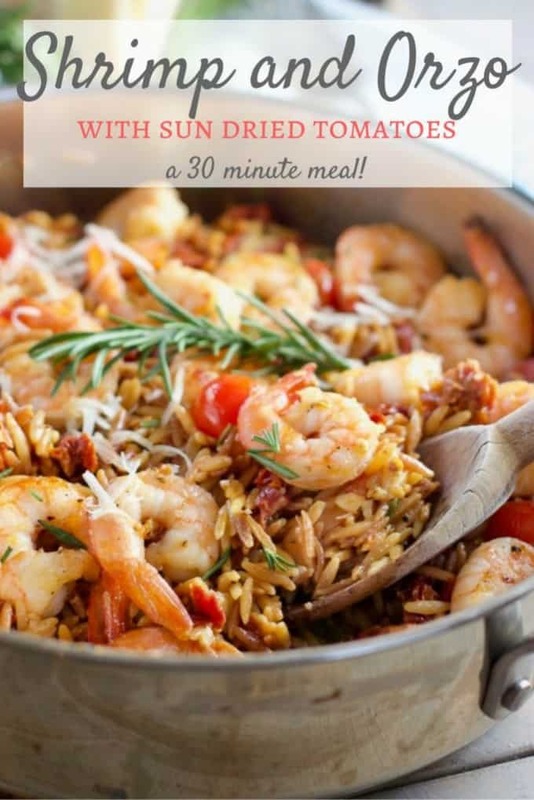 How to make 30 Minute Shrimp and Orzo with Sun Dried Tomatoes! Drain your sun dried tomatoes RESERVING two tablespoons of that tomato infused oil and saute your shrimp. 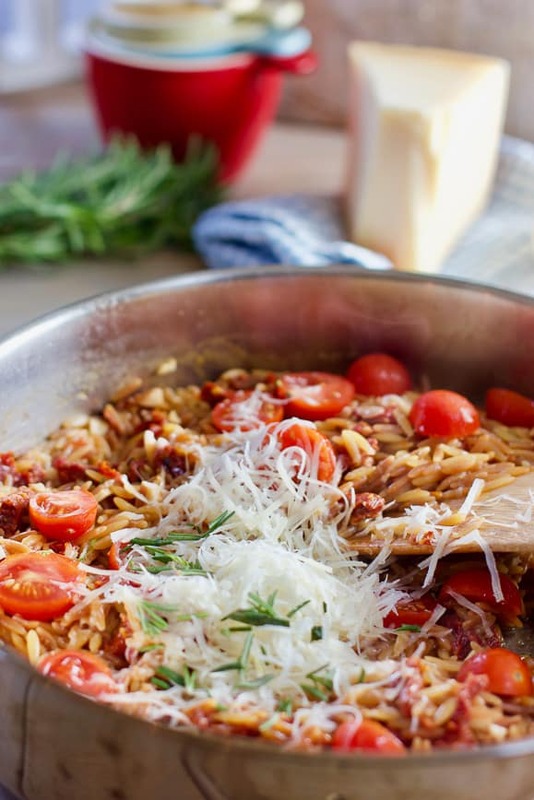 Set them aside and now toast your orzo in the same pan. It only takes a couple minutes until the pasta gets just lightly brown. Adding more flavor! Then toss in your drained sun dried tomatoes, garlic and a bit of rosemary if you have it. Thyme would be great in this as well. Add your chicken broth. If you want a creamier texture you can substitute half a cup of the broth for either heavy cream or half and half. I also threw in a few cherry tomatoes I had hanging around, but it’s not necessary. Just cleaning out the fridge :). This dish is perfect for that! 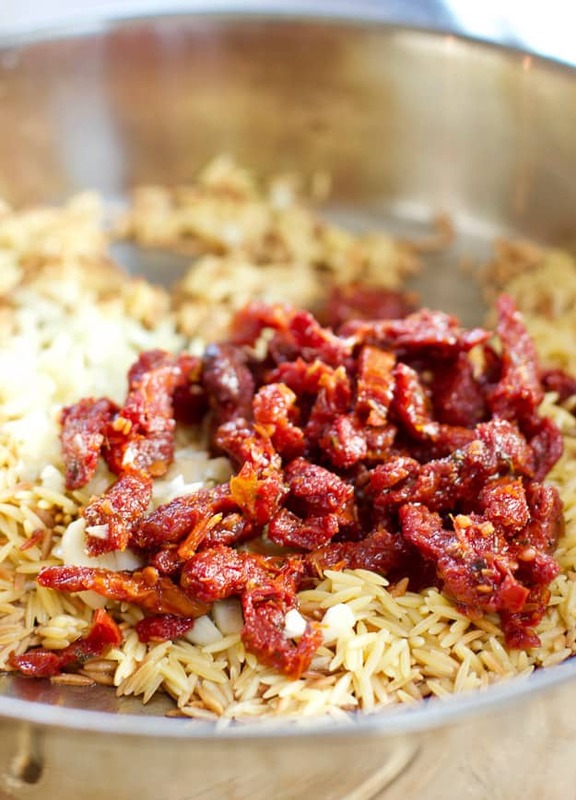 Tips and Subs to make Shrimp and Orzo with Sun Dried Tomatoes! Add in broccoli or asparagus when just a bit of the broth remains in the skillet. Will steam it up perfectly…now you don’t have to make a salad! yay! Substitute rice for the orzo. Add 1/4 more chicken stock making it 2 1/2 cups. Substitute a half cup cream or half and half for a creamier texture. (ie: 1 3/4 cup chicken stock and 1/2 cup cream). Use fresh herbs like rosemary or thyme for color and MORE flavor. You can see all of our One Pan Dinner HERE. 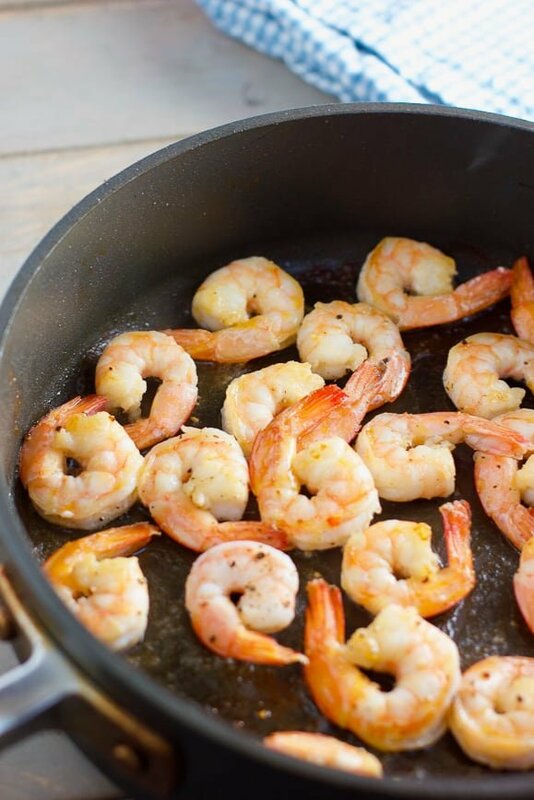 Another of our favorite easy Shrimp Dinners is this Chili Lime Shrimp Fajita Sheet Pan Dinner ! To easy one pan dinners! An easy one pan meal that your family will love! 30 minutes is all it takes for this beautiful skillet dinner! Drain the sun dried tomatoes, RESERVING THE OIL. Heat a large skillet. Add 2 tablespoons of the reserved oil from the sun dried tomatoes. Sear shrimp 2-3 minutes on each side being careful not to over cook as they will require some cooking time when added back in. Remove shrimp and set aside. Add 1 tablespoon butter to the skillet. Add in orzo and toast until lightly brown. About 3-4 minutes. Add drained sun dried tomatoes, garlic and rosemary. Cook for 2-3 more minutes until garlic is fragrant. Add chicken stock. Reduce heat to low and simmer for about 15 minutes until all the reserved stock is gone and orzo is light and fluffy. Toss in 1/2 cup grated asiago or parmesan cheese and the reserved shrimp. Heat through until shrimp is warm. Top with additional grated cheese if you like. We love this served with a simple salad and crusty french bread! Really enjoyed this a lot. Because I’m lazy, I bought tiny, peeled and precooked shrimp. I also used the recommendation of adding broccoli or asparagus to throw in a few healthy handfuls of chopped spinach. Also used fresh rosemary and basil from my window planter. I will definitely be making this one again. Looks good, I’ll have to try this one. Thank You SOOOO much for including the nutritional info. I’ve made this dish twice and I’m in love with the flavor, but I sub in rice and twice it’s finished undercooked. What’s a good solution for this? More chicken broth? San Francisco treat! You sleigh me! This is Pinned and I will be trying it this weekend! Happy New Year Kathi!